After reviewing the Nikon mount ZF.2 version of the Zeiss Sonnar T* 2/135 we’ve now analyzed the Canon ZE mount model. Read on to find out how well it performs. 16 years on from its launch the Canon EF 135mm f/2L prime is still going strong and available to buy brand new today. 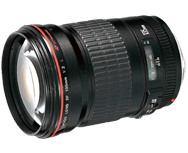 With a wide maximum aperture, useful telephoto focal length and good build quality it offers some attractive features. Costing $1,000 however it’s at the expensive end of the range for a standard telephoto prime. So with newer, fresher and cheaper competition coming on to the market all the time is this old-timer still relevant? Canon’s EF 135mm f/2.8 Softfocus lens blurs images and reality – on purpose. With just a flick of the wrist and lens, the 135mm f/2.8 Softfocus allows photographers to have a “softfocus” in their images. The effect produces a blur and halo throughout the photograph. But how clear are the lens’ images when you take away the blur?